On PHANTOM OF THE PARADISE’s release in 1974, only two cities experienced brisk business at the box office, Paris and Winnipeg. In fact, the caribou-munching residents of Winnipeg love the film so much they hosted “Phantompalooza”, a festival dedicated to it, both in 2005 and 2006. The rest of the world received De Palma’s retelling of Gaston Leroux’s The Phantom of the Opera, a grotesque vehicle for a none-too subtle swipe at the commercial state of the music industry, with something approaching scorn. It’s not hard to see why the movie failed. It’s wild and ludicrous, rough around the edges and filled with self-aware, grotesque humour that frequently threatens to see the filmmakers enjoy themselves more than the audience. It’s no surprise that it was frequently screened in a double-bill with THE ROCKY HORROR PICTURE SHOW, a film I want to like but just can’t because I can never find the charm or wit beneath its raucous, shoddy mess. For the first half an hour or so of PHANTOM OF THE PARADISE I had the same problem. From Rod Serling’s portentous opening voice-over to the slapstick shenanigans of Winslow Leech (Finley) as he’s disfigured and turned into our fetishistic phantom, I was struggling to find the pleasure in it all. This isn’t unusual for me when it comes to De Palma. I find him an extremely uneven director. One moment he achieves cinematic brilliance, the next he misfires so awfully I’m at a loss as to how it can be the same man behind the camera. I wouldn’t wish cinema without him, better an unreliable genius than a bland vacuum, but I was more than ready to put PHANTOM OF THE PARADISE down as a miss rather than a hit. Then, somehow, my mood shifted. I can’t say it was because the tone of the movie changed, rather my appreciation of it. As if I had passed through a cultural airlock, my state of mind equalising with that of the movie. Simply: I began to get it. A big factor in my growing enjoyment has to lie at the feet of Paul Williams, famed songwriter, actor and perfectly-cast villain of the piece. His songs are simply too good to be ignored, his performance so gentle and yet still rising above the pantomime excess that surrounds it. That is not to say De Palma doesn’t also deserve due credit, it is, after all, his film, but in Williams is the cream on the lemon tart, the shot of brandy in De Palma’s espresso. It’s a film that is barely in control of itself, never less so in it’s chaotic climax as De Palma and Williams both admit in the special features. The fact that said climax is so effective, precisely because you can tell that madness flooding across the screen is genuine, is a perfect illustration of the film as a whole. Frenetic, sometimes ill-judged yet never less than engrossing and affecting, I finished it with an understanding of what the noble Winnipeg saw that everybody else missed. 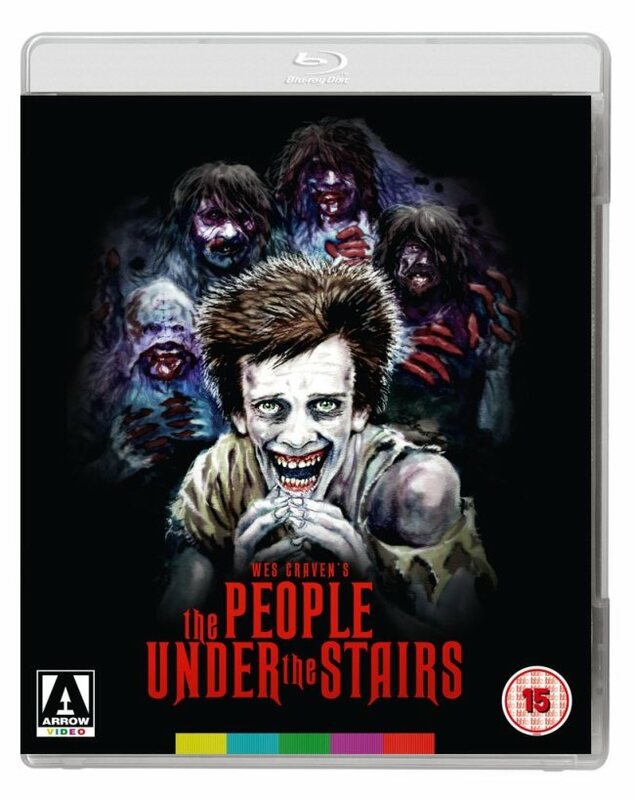 As one would hope, the film looks and sounds excellent, but it’s the disc’s support acts that will provide a major draw. There is an excellent (and unsurprisingly Gallic) documentary on the making of the movie, with cast and crew offering frank and amusing insights into its conception, commercial failure and then cult success. There is also — and I suspect it is this that will have the movie’s fans reinvest in Arrow’s disc — a 72 minute interview with Paul Williams conducted by Guillermo del Toro. Del Toro is gushing in his enthusiasm for the movie and Paul Williams in general and the conversation is frequently fascinating. There is also an archive interview with Rosanna Norton, the movie’s costume designer; a piece on the changes forced on the movie in postproduction; outtakes and bloopers; trailers; radio spots and an isolated music and effects soundtrack. 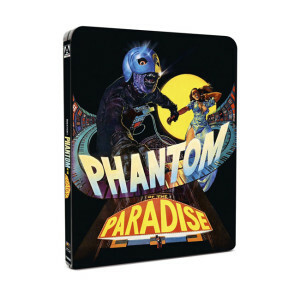 Add to that an exhaustive booklet and a choice of conventional or limited edition, steel book packaging and you have a suitably lavish production. 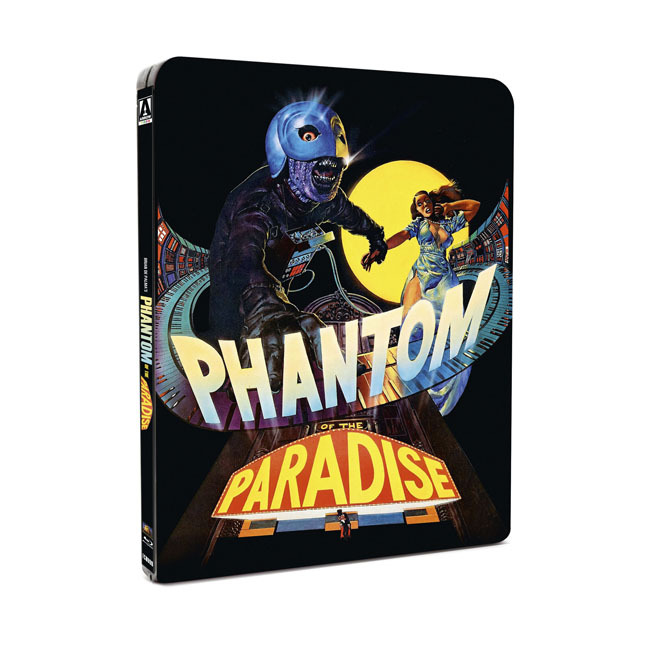 Given that the forty years since the movie’s initial release has seen the music industry — and the entertainment industry in general — become even more insidious, crass and morally vapid than De Palma feared, perhaps PHANTOM OF THE PARADISE has found its time to be lauded at last.